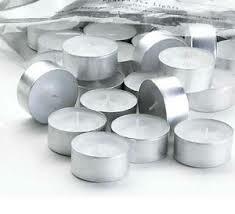 Our 100 pack unscented Standard Tea lights will perform better than the competitors. Long burning tea lights are an exceptional value when compared to other no name brands that burn for only 2-3 hours. Keep lighted candles out of the reach of children and pets. Avoid burning candles near combustible materials. Always store candles in a cool, dark, dry place. They should be stored flat to prevent warping. Avoid putting candles in drafts to prevent rapid and uneven burning and excessive dripping. Keep wicks trimmed to one half inch. Long or crooked wicks cause uneven burning and dripping. To remove wax from washable fabrics, scrape off excess wax and run boiling water through the material. Remove wax from holders by running very hot water over them. Candles should always be burned in proper candle-holders or bases, and should be two and half inches apart from each when burning oustside a holder. Keep tea light wicks centered and trimmed to 1/4" while burning. What is the best way to store candles? Candles should be stored in a cool, dark, dry place and, for tapers, in a flat position to prevent warping. When stored properly, candles can be enjoyed for years and play an important role in traditions. Domestic candle manufacturers have a long tradition of making high quality, long-lasting and safe candles. National Candle Association members – manufacturers and suppliers – are working with the American Society for Testing and Materials (ASTM) to implement voluntary standards for candles. Both Neo-Image Candlelight and North Americant Candle are proud members of the National Candle Association. Are candles safe to use? Are candle wicks made of lead? The majority of wicks manufactured today in the U.S. are made of 100 percent cotton – with no metal core. Those few wicks with metal are typically zinc-core wicks. All of these wicks are safe. Even though the U.S. Consumer Product Safety Commission (CPSC) determined in 1974 that lead-core wicks do not present a health hazard, the National Candle Association’s members voluntarily agreed to stop using lead wicks. Companies belonging to the National Candle Association make about 95 percent of the candles manufactured in the United States today. It is possible that a small percentage of imported candles on the market today contain lead-core wicks. However, the National Candle Association and the Consumer Product Safety Commission have taken strong action to remove candles with lead-core wicks from store shelves. This will help ensure that all candles on the market today use safe wicks. If a consumer is still worried, how can he or she tell whether a candle has a lead-core wick? A consumer can determine if a candle has a lead-core wick by using this simple test: Rub a piece of paper on the tip of an unused metal wick. A lead-core wick will leave a gray pencil-like mark, while zinc or tin will not. It is important for consumers to know that wicks made with cotton, paper, zinc, or non-metallic materials are safe. Is it safe to burn candles in a house with children? Safety, including issues such as children’s health, is a top priority for National Candle Association members. That is why our organization adopted a voluntary ban on lead wicks and supports the removal of candles with lead wicks from store shelves. Soot is a natural by-product of incomplete combustion and is comprised primarily of carbon particles. Soot can be caused by fireplaces, stoves, furnaces or even from cooking. If candle wicks are kept trimmed and there is proper ventilation with no drafts, there should be no incomplete combustion and, therefore, no sooting from candles. In any house, there are literally millions of airborne particles that can adhere to surfaces. These particles include a wide variety of naturally-occurring substances such as dirt, dust and pollen. If windows are open, particles may come from car or truck exhaust, barbecues and burning leaves. Due to natural airflow, these particles tend to adhere to ceilings, walls and window treatments. Because of static electricity, they also tend to collect on or near electrical appliances, TV or computer screens. Do scented candles produce more soot or smoke than non-scented candles? Not necessarily. While unscented wax may tend to burn more efficiently in general, it is the size of the wick and flame that makes the most difference, not the fragrance. Candles produced using appropriate raw materials should burn cleanly if used properly. What kind of quality control testing do candle manufacturers perform? Each NCA member company has its own quality control procedures. Most member companies perform methodical testing of their products to ensure optimum performance. Do burning candles cause air pollution? When candles are burned properly, they pose no known health risk. What kind of label information is required to be placed on candles? No safety information is required on candle labeling. However, most candle manufacturers voluntarily place safety and use instructions on their candles. The National Candle Association is working with the American Society of Testing and Materials (ASTM) to create voluntary labeling standards for the industry.